1. Click the Clients shortcut in the navigation pane. 2. 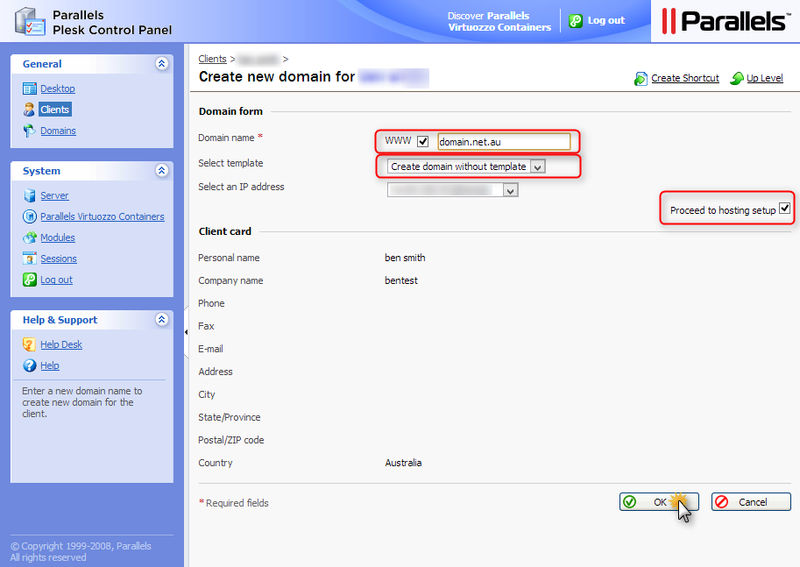 Select the Client you wish to create the domain forwarding for. 3. Click Add New Domain. 4. Specify the domain name. 5. Leave the www check box selected if you wish to allow users to access the site by a common and habitual URL like www.your-domain.com. Having the www alias preceding the domain name will allow users to get to the site no matter what they type in their browsers: www.your-domain.com and your-domain.com will both point to the site. 6. 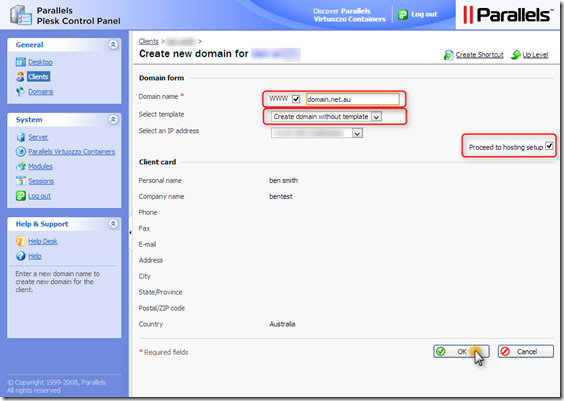 Leave the Create domain without template option selected in the Select template menu. a. If you have a number of IP addresses to choose from, select the required address from the Select an IP address drop-down box. b. Bear in mind that e-commerce sites need a dedicated IP address (not shared among other sites) to implement Secure Sockets Layer data encryption. 7. Make sure that there is a check mark in the Proceed to hosting setup check box and click OK.
8. Choose the forwarding type: select either Frame forwarding or Standard forwarding option. 9. With standard forwarding, a user is redirected to the site and the actual site’s URL is shown in the user’s browser, so the user always knows that he or she is redirected to another URL. With frame forwarding, a user is redirected to the site without knowing that the site actually resides at another location, therefore, Frame forwarding should be preferred. 11. Specify the destination URL: the current web site address that you would like this domain to point to. 2. Select the domain that you wish to change the hosting for. b. If there is a Blue ST or FR icon then there is already forwarding setup on the subscription. 6. Select the Hosting Type that you require. 8. Specify the destination URL: the current web site address that you would like this domain to point to.